June 30, 2012 - Jeppesen recently introduced a version of its industry-leading FliteDeck Pro electronic flight bag (EFB) solution for Windows-based devices. Available for Windows platforms including tablets, the new Jeppesen FliteDeck Pro version 7.1 runs on the Windows 7 operating system and is designed to increase situational awareness and mobile functionality for commercial aviation operators. Jeppesen FliteDeck Pro provides operators with a suitable paper chart replacement solution for critical enroute data and other flight information, as determined by the FAA. The interactive, data-driven enroute display is dynamically rendered and also includes real-time graphical and textual weather information, available through XM WX or Jeppesen Weather services. Operators also now have the unique option of inserting their own charting data and flight operation information with Jeppesen FliteDeck Pro 7.1, a first in the commercial aviation industry. The new Customer Inserted Content (CIC) application allows customers to insert their own PDF charting for display alongside their Jeppesen charts. 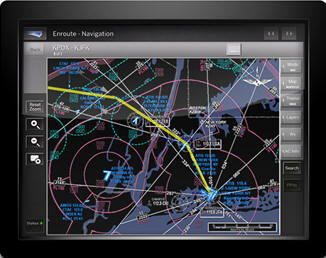 “Introducing Jeppesen FliteDeck Pro 7.1 for Windows devices including tablets provides new opportunities for enhanced delivery of EFB flight information on a technology platform that is easily integrated by airline flight crews today,” said Tim Huegel, director, Jeppesen Aviation Portfolio Management. With Jeppesen FliteDeck Pro, operators are able to filter the display of preferred enroute information on-screen by selecting airports, airways, waypoints, airspace, NAVAIDs and terrain data. The open framework of FliteDeck Pro is flexible and scalable, to allow for customized company data display or third-party applications across multiple aircraft types. Jeppesen Airport Moving Map (AMM) functionality included in FliteDeck Pro 7.1 includes more than 700 airports and delivers dynamic airport map rendering. AMM allows for real-time aircraft position display on the ground to reduce potential runway incursions and increase situational awareness in the flight deck. Jeppesen’s standard bearing charts and flight data offer optimized, vector image rendering of updated chart information through FliteDeck Pro. Jeppesen database information is resident on the device, which eliminates the concern for online connectivity while in the air. Complete access to Jeppesen’s global library of terminal charts, change notices and text information is available at the tap of a finger. Additional touch-screen functionality included with Jeppesen FliteDeck Pro offers the ability to highlight information on any chart or flight document, including taxi routes. Highlighted information can then be shared across EFBs in the flight deck to increase situational awareness.